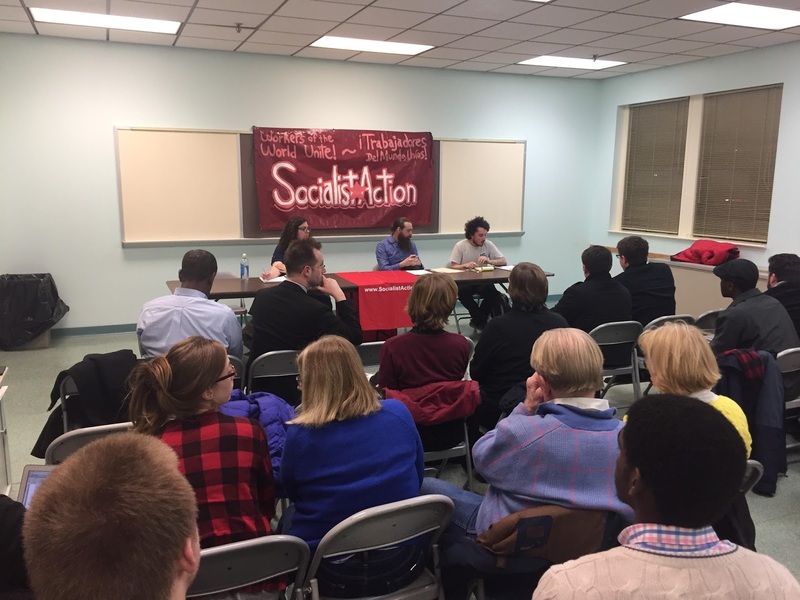 Membership in Socialist Action is open to open to anyone who is in general agreement with our program, commits to being an active member of the organization, pays dues, and who agrees to abide by group decisions. New members go through a 3 month trial run, which we call Provisional Membership. During this time the new member gets to come into the group and see if membership is right for them. Membership dues are $10 a month, plus any additional donations that they can afford. We understand that money is tight for most of us, but our organization is funded entirely by its members and supporters, so it's important that we contribute what we can. By not relying on grants or handouts of wealthy donors, we are able to maintain our independence. Currently our membership meetings are held once a month. At these meetings we discuss the campaigns that we are involved in, plan our forums, vote on any proposals that are made, and hold classes on political theory and the history of our movement. This may all sound a bit daunting, but we do ask that members make a serious commitment. After all, the goal we have set for ourselves as a movement is pretty epic. But being a revolutionary isn't all about sacrifice. It's also an opportunity to grow and develop into a more well rounded individual leading a more meaningful life. Joining the revolutionary movement exposes you to new ideas, new experiences and new people, all of which broadens your horizons. We believe that in striving together to make a better world we can become better people. So think it over, and if you'd like to try membership in Socialist Action get in touch with us. We'd love to hear from you! To contact Socialist Action about joining, or anything else, you can send an email to adamritscher@gmail.com.